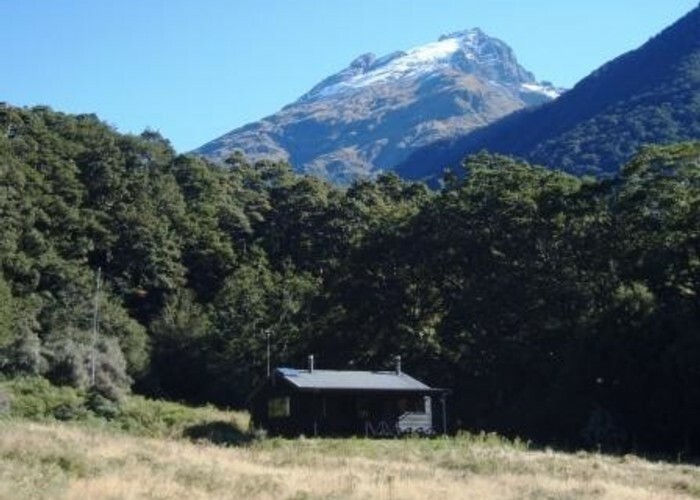 Kerin Forks Hut (10 bunks, wood-burning stove, firewood avail., tank water) is a spacious, comfortable hut at the back of terraces above the Wilkin River flats. The hut gets quite a lot of traffic as it lies on both the Siberia circuit and Wilkin-Matikitiki (Rabbit Pass) tracks. It's an easy walk in from the roadend but a little tedious along river flats or sidling in the bush. The Makarora is notorious and it may be best considering crossing by boat in all but low flows. The Wilkin need only be crossed once, opposite the hut (though in low flows multiple crossings avoid sidle sections) - and is possible in low-moderate flows, but can also be tricky. Many people avoid the river crossings & less interesting lower valley by travlelling to the hut by jetboat (Makarora Wilderness Lodge for details). Flights into / out of Siberia Hut are also an option. The swingbridge at the Blue River confluence (12km up the Makarora) is another option to cross the Makorora. Kevin Forks Hut • By madpom. Licence: cc by. Added 8 July 2007 by madpommadpom. 1 revision 19 April 2009 by pmckepmcke.